One of nursing homes’ most vigilant government watchdogs plans to dramatically curb its activities this year, a federal official has told the House Ways & Means Subcommittee on Health. The Department of Health and Human Services Office of the Inspector General anticipates reducing Medicare and Medicaid oversight activities overall by 20% in fiscal year 2014, said Gloria Jarmon, OIG deputy inspector general for audit services. If the agency does scale back its investigations into Medicare and Medicaid improper payments, it could mean a reprieve for long-term care providers that have faced increasing scrutiny from the OIG and other watchdogs — scrutiny that they say often is unwarranted. Providers recently won a victory on this front when the Centers for Medicare & Medicaid Services announced a suspension of recovery audit contractor activity, pending new contracts. Budget cuts are to blame, Jarmon said during a hearing on efforts to reduce Medicare waste, fraud and abuse on Wednesday. She urged the subcommittee to support the OIG’s 2015 budget request. The proposed White House budget calls for a 6-percentage point increase, which would bring the total OIG budget to $75 million. The House subcommittee generally did not share the provider perception that fraud and abuse oversight has become too onerous. Many members said that more has to be done and lambasted CMS and OIG for being ineffectual. Rep. Jim Gerlach (R-PA) said the witnesses should be “embarrassed” by their organizations for allowing improper Medicare payments to reach $50 billion annually. 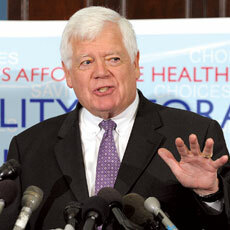 Rep. Jim McDermott (D-WA) — who in the past has introduced significant long-term care legislation regarding rehab care and payments — warned that payment changes under the Affordable Care Act could lead to particularly insidious forms of fraud and abuse. For example, payments are increasingly linked to quality measures, and detecting providers who are manipulating these quality metrics could be much harder than, say, busting a fraudster operating a false storefront, he said. McDermott is the Subcommittee on Health’s ranking member; Rep. Kevin Brady (R-TX) chairs the panel.